2019 Mitsubishi Outlander Trim Levels with Comparisons & Configurations. What 2019 Mitsubishi Outlander Trim Level Should you Buy? What is the Difference Between Trims? These days, more and more families are rejecting the mini-van in favor of SUVs with third-row seating. Thanks to a relatively low introductory price, the Mitsubishi Outlander is a strong competitor in this market. With five different trim levels to choose from, there are plenty of options depending on the consumer's needs and budget. The newest Outlander is part of the third generation, which was introduced back in 2014. For 2019, the vehicle received a fresh look that included updated, sleeker headlights. Both the suspension and the steering were slightly tweaked in order to improve handling as well as ride comfort. All trim levels of the Outlander now ride on 18-inch wheels. The final big change for 2019 was the addition of rear seat climate control vents, something that is sure to be appreciated by the back passengers during the summer. When it comes to trim options, buyers will be able to choose from a well-equipped base model all the way up to a top-of-the-line GT. The GT is the only version of the 2019 Outlander to have a V6 engine option. There are several differences between each trim level, giving consumers plenty to consider when making their final decision. Additionally, drivers will need to choose between front-wheel-drive and what Mitsubishi calls Super All-Wheel Control. This S-AWC system is actually a combination of several technologies designed to give drivers maximum traction in a variety of road conditions. It includes things such as anti-lock brakes, electronic brake force distribution, and active stability control. This trim comparison will point out all of the key differences between the five trim levels of the Outlander. It is designed to make the decision-making process easier. 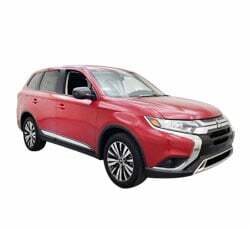 Compare the 2019 Mitsubishi Outlander ES vs SE Trim Levels. What is the difference? Each trim level of the Outlander is available in both front-wheel-drive and all-wheel-drive versions (S-AWC), with the exception of the GT, which is AWD exclusively. There are many standard exterior features that are available on every trim, including halogen headlights, LED daytime running lights, and heated/power side view mirrors. As for style, each Outlander has chrome grille accents and silver accents on the front bumper. The ES trim features a color multi-informational display. Like all trims, it has heated front seats and comfortable seating for 7. A gloss black floor console and chrome plated door handles can be found on all trims of the Outlander. When it comes to convenience features, the base level ES is well-equipped. It has a 7.0" touch panel display audio system, digital HD radio, and Bluetooth wireless technology. Drivers will also enjoy the steering wheel-mounted audio and phone controls. Rounding out the convenience features of the ES is cruise control, a front USB port, two 12-volt power outlets, and a rearview camera. All versions of the Outlander have plenty of space for both passengers and cargo. These vehicles boast 63.3 cubic feet of cargo space. The rear seats can be split and folded down either completely or with a 50/50 split. Those needing even more room can lay down the second row seats. Optional roof racks can be added as well. The ES is powered by the same engine that is under the hood of all Outlanders except the GT. It is a 2.4L 16-valve inline 4-cylinder that produces 166-horsepower and 162 lb-ft of torque. All Outlanders equipped with this engine are also equipped with a Continuously Variable Transmission (CVT). This smooth transitioning transmission is designed to work with less oil to make it more efficient. Drivers who go with an FWD Outlander powered by this 2.4L engine can expect an EPA estimated 25 MPG in the city and 30 on the highway. Upgrading to AWD results in a slight reduction in fuel efficiency, with these vehicles getting 24 MPG in the city and 29 MPG on the highway. Consumers who are looking to take their Outlander to the next level should consider the SE. It is the first trim to have fog lights as a standard feature. Buyers can also choose to add power-folding side mirrors and a glass sunroof, but these are not standard features until the next trim up. Moving inside the SE, drivers will find a leather-wrapped steering wheel and shift knob. Soft-touch seats add to the level of comfort inside this vehicle. The steering wheel of this trim also adds convenient voice controls as well as a USB port in the back. It gives consumers an 8-way adjustable power driver and front passenger seat. The SE also upgrades the keyless entry system to the FAST-key passive entry system that features push-button start. When it comes to the color display of the SE, as well as every trim level above it, there is a difference between FWD and AWD models. The FWD will have the same color multi-informational display as the base level ES, while AWD will be upgraded to an LCD Smart Phone Link audio display. The SE is the first trim level to give drivers Android Auto and Apple CarPlay compatibility. Compare the 2019 Outlander SE vs LE Trims. What is the difference? The Outlander LE has a unique and sleek style. It features a black front and rear bumper lower garnish and black side door garnish. The LE also is the only trim to have black side view mirrors that have turn signal indicators. All in all, the exterior accents are darker on the LE than any other trim. To complete the look, the LE sits on 18-inch black painted alloy wheels. Black touches are found on the inside of the LE trim as well. This is the only version of the Outlander that has gloss black window switch panels and black headliners. The power glass sunroof is standard on this trim. Finally, the LE is the first Outlander to offer Blind Spot Warning, Lane Change Assist, and Rear Cross Traffic Alert as standard features. These safety features are optional on the SE and unavailable on the ES. Compare the Outlander LE vs SEL Trim Levels. What is the difference? Making the jump up to the Outlander SEL gives consumers many more cutting edge features. Auto on and off headlights are standard, as well as front rain-sensing windshield wipers. Stylistically, this trim comes decked out with chrome beltline molding and silver roof rails. Interestingly enough, the sunroof goes back to being an optional feature for the SEL. On the inside of the SEL trim, consumers will find leather-appointed seating as well as silver painted instrument panel accents. Drivers will also find an auto-dimming rearview mirror with Homelink, which is a convenient option for opening and closing garage doors, turning off and on interior and exterior lights, and activating or deactivating a security system. A power control tailgate is also standard. This feature allows drivers to open the cargo area with just a press of a button and then close it using only one finger. The SEL is the first trim level to have additional available safety features. Consumers can add Adaptive Cruise Control, Lane Departure Warning, Automatic High Beams, and Forward Collision Mitigation. Compare the Outlander SEL vs GT Trims. What is the difference? For many consumers, the most significant difference between the GT and other trims is underneath its hood. This is the only version of the Outlander that is powered by a 3.0L 24-valve V6. With this engine, drivers will enjoy 224-horsepower and 215 lb-ft of torque. This engine will give drivers and EPA estimated 20 MPG in the city and 27 MPG on the highway. The GT has a 6-speed electronic automatic transmission with paddle shifters. Towing capacity also gets a bump for this trim, going up from 1,500 pounds to 3,500 pounds. On the exterior of the GT, consumers will find standard LED high and low beam headlights. This trim also features LED fog lights standard. The sunroof once again becomes a standard option on the GT. This upper-level trim features a windshield wiper de-icer. Like the AWD versions of the last three trims, the GT has the LCD color multi-informational display. Thanks to its upgraded transmission, the GT also features a drive mode selector. The heated steering wheel, which was optional on the SEL, becomes a standard feature for the GT. While all versions of the Outlander have a rearview camera, the GT's is upgraded and features a multi-angle system. By using multiple cameras, this system is able to give drivers a bird's eye view of their vehicle. For drivers who are looking at the Outlander more for affordability, the SE presents a good choice as well. It adds smartphone integration and push-button start to the ES without adding too much to the price tag. Consumers who go with the SE should give serious consideration to upgrading to AWD, which will also give them the better touchscreen. Although each trim of the Outlander has a long list of desirable features, the V6 engine makes the GT the best choice. This top-of-the-line trim has enough additional features to make it worth the additional expense. Things like leather seating, standard AWD, and LED headlights make the Outlander GT a smart buy. To really get the most out of an Outlander, consumers may want to consider adding the Touring Package. This is what adds those extra driver assistance safety features to the vehicle. With more and more vehicles coming standard with things like adaptive cruise control and forward collision mitigation, consumers may regret buying a new vehicle without them down the line. Ultimately, drivers looking for an SUV with third-row seating and a V6 will be well served by the 2019 Mitsubishi Outlander GT.